This plum tart is a dessert of a shyer order, less ostentatious than its flashy friends. Most fruit tarts flaunt their bright fillings. Whether their fruit is added to pastry before or after baking, they’re vivid confections — conspicuously appealing and hard to resist. This plum tart is a dessert of a shyer order, less ostentatious than its flashy friends. On the surface, it’s subtle, looking like a giant shortbread cookie. 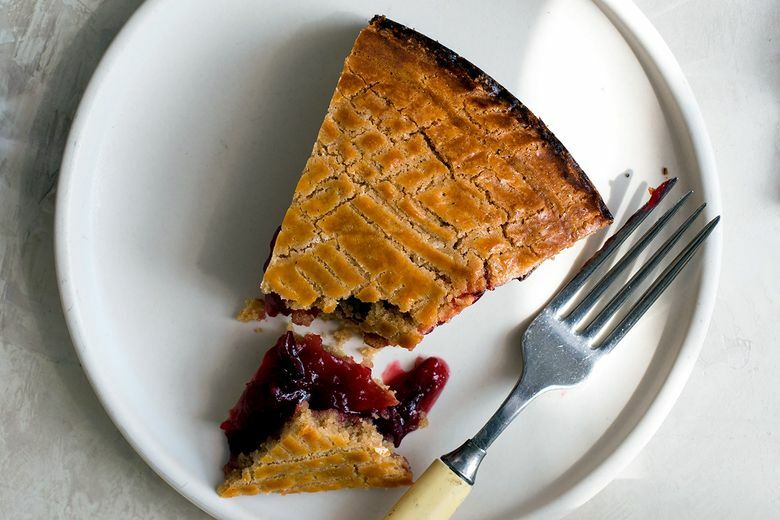 But once it’s cut, the tart reveals a magenta stripe of simmered plums in each slice — fragrant with cinnamon and glistening with honey. 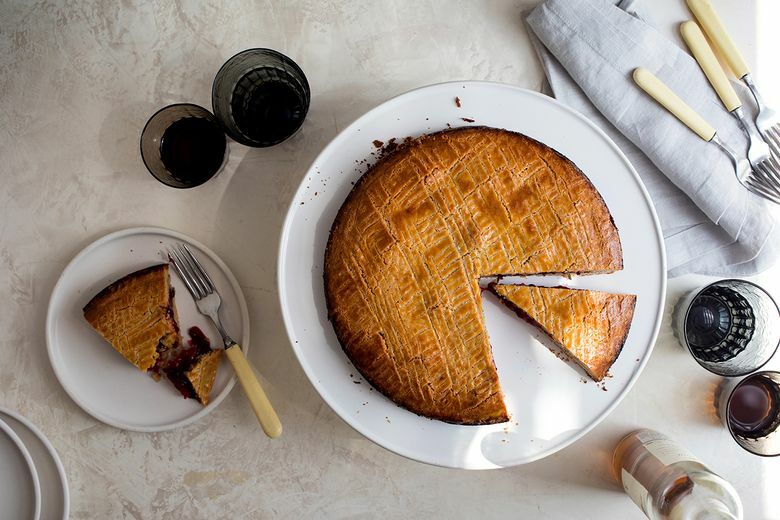 The recipe is based on a gâteau Breton, a traditional flat cake from Brittany consisting of an egg yolk-enriched, butter-based dough that sometimes sandwiches jam or dried fruit purée. Older recipes often call for using all- or part-buckwheat flour, once the region’s principal grain (and used in its famous crepes). Now, you’re more likely to see gâteaux Breton made with regular wheat flour, which, in combination with the butter, gives it a particularly rich, crumbly texture. I’ve made the recipe with puréed dried apricots or prunes in the center, homemade or spooned from jars of lekvar (also known as prune or apricot butter). But when fresh plums are plentiful, it makes sense to use those instead. And, if you find red or purple ones, they’ll make for an extremely pretty slice. 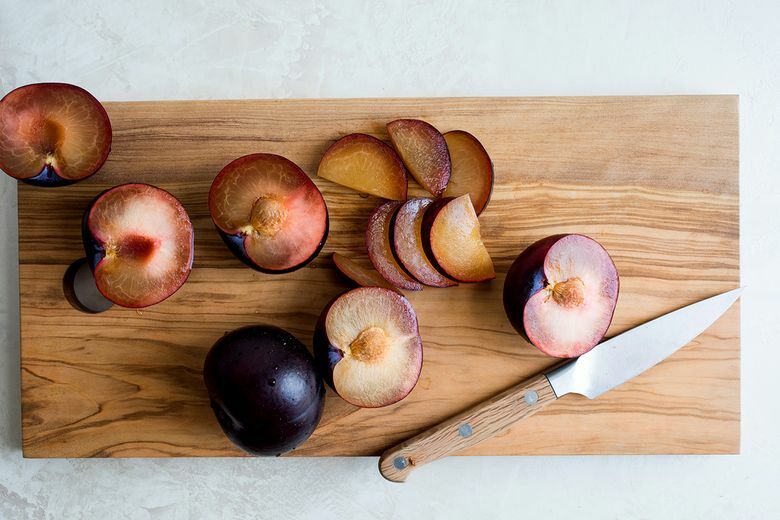 You will need to cook the plums down, but that takes only about 15 minutes. While they simmer, you can add aromatics to the pot. I threw in a cinnamon stick and a rosemary sprig, along with some honey. But feel free to play around with other herbs and spices. A few slices of ginger root and some lemon thyme could also be nice. You could also skip the compote and substitute jam in a layer as thick or thin as you like. A thin one will be elegant and restrained; a thick spread, sweeter and more extravagantly messy. 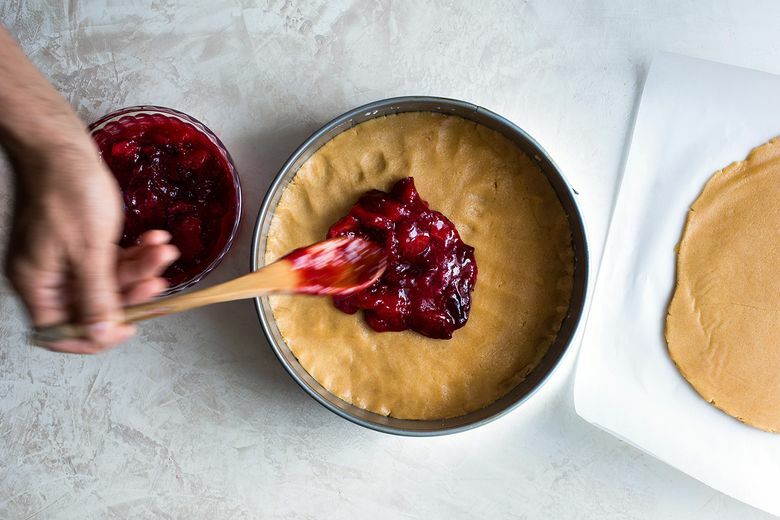 Just be sure to choose a jam with good acidity, so that it’s tangy next to the buttery dough. Raspberry and orange marmalade fare better than strawberry and peach, but the possibilities for variation are many. 1. In a food processor, process 1 cup sugar until powdery and fine, about 1 minute. Add flour, cinnamon and salt; pulse to combine. Add butter and pulse until mixture resembles breadcrumbs. Add egg and 4 egg yolks, and pulse until mixture comes together. Divide dough in half, form into disks, and wrap in plastic wrap. Chill at least 2 hours or until firm. 2. 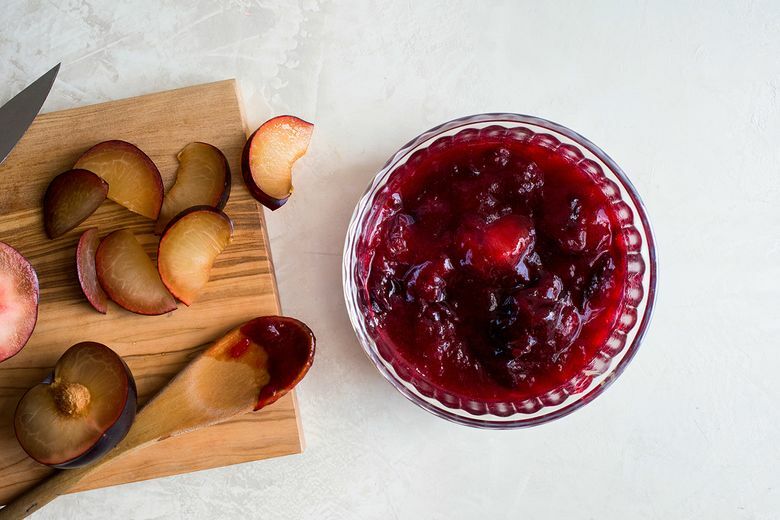 In a small saucepan, combine plums, 1 to 3 tablespoons sugar (this depends on how sweet your plums are), cinnamon, honey and rosemary sprig, if using. Simmer until jammy and thick, 15 to 20 minutes, stirring occasionally. Transfer plum mixture to a bowl to cool, and remove cinnamon stick and rosemary sprig. Taste and stir in more sugar if mixture seems very tart. 3. Heat oven to 350 degrees. Grease an 8-inch springform pan and place it on a rimmed baking sheet to catch any butter leaks. 4. Between two sheets of parchment paper or plastic wrap, roll one of the dough halves into an 8-inch circle. Transfer dough to prepared cake pan, pressing into edges. Spoon plum compote on top of dough, leaving ¾-inch border around edge. 5. Roll second piece of dough into an 8-inch circle, transfer to pan, press around outside edge to stick the pieces together and seal in fruit. 6. In a small bowl, combine remaining egg yolk with 1 teaspoon water and beat lightly. 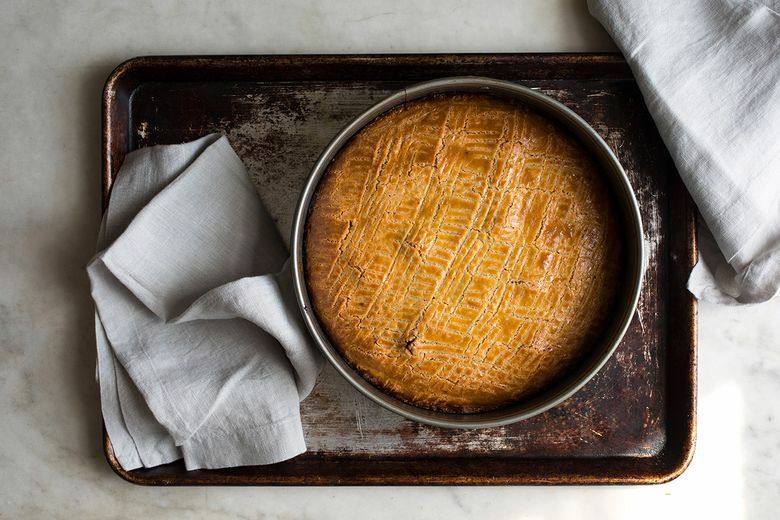 Brush over top of cake, then use a fork to score a crisscross pattern into the dough. Bake until golden brown, 1 hour (cover with foil if cake is browning too quickly). Cool in pan for 15 minutes, then run a butter knife around the inside edge of the pan and unmold from ring. Cool completely and serve.